Updated Wednesday November 21, 2018 by OBBA. Old Bridge Basketball has teamed up with Modell's Sporting Goods to offer all players 15% off all regular and sale merchandise. 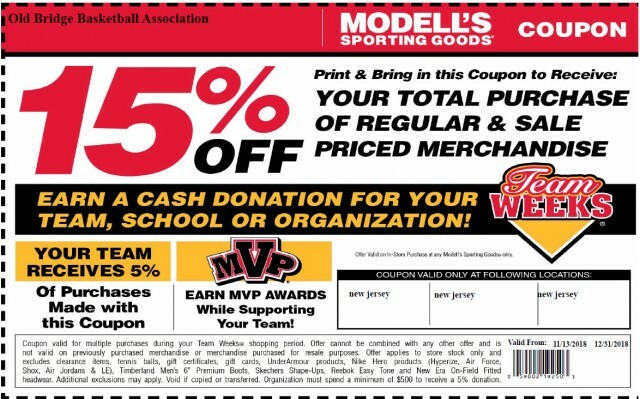 With every purchase made, Old Bridge Basketball will receive 5% back, but you must present the attached coupon. This is a great time to stock up all your basketball attire and equipmentwhile greatly benefiting The Old Bridge Basketball Association. Hurry and enjoy the savings!